As more and more pundits are predicting a GOP victory in the upcoming mid-term elections, Hollywood liberals are digging deeper into their pockets doling out the cash to Democrats mostly targeted toward keeping the Senate in Democratic hands. In addition to a $10,000 donation to the Democratic Congressional Campaign Committee and $2,600 to House Minority Leader Nancy Pelosi (D-Calif.), Streisand gave $1,000 to the campaigns of Democratic Sens. Mark Udall (Colo.), Jeanne Shaheen (N.H.), Jeff Merkley, (Ore.) and Mark Begich (Alaska), all top GOP targets. 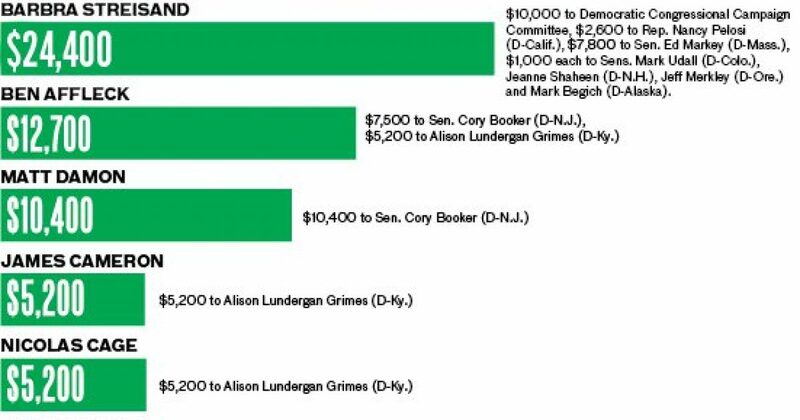 One of the biggest recipients of the entertainment industry’s dollars is Kentucky Democrat Alison Lundergan Grimes, who is in a tight battle against Senate Minority Leader Mitch McConnell (R). Her donor list reads like a who’s who of Tinseltown: producer J.J. Abrams, Ben Affleck, comedian Jack Black, “Avatar” director James Cameron, Nicolas Cage, Danny DeVito, Cameron Diaz, DiCaprio, Jennifer Garner, director Steven Spielberg, Tom Hanks, Jerry Seinfeld, Mike Myers and “Mad Men’s” Jon Hamm, all giving $5,200 each, the maximum amount an individual can give to a single candidate in a two-year election cycle. Other Grimes donors include DreamWorks CEO Jeffrey Katzenberg, Woody Allen, Ted Danson, America Ferrera, Leonard Nimoy, Streisand, “West Wing” writer Aaron Sorkin, Ben Stiller and Chris Rock. While some celebrities such as NFL stars John Elway and Peyton Manning donated to Republicans, the vast majority of money went to Democrats.